Late check out (after 11:00 and before 14:00) may result in a fee. The standard booking price includes the following: all taxes-Utilities (water, gas and electricity), internet and Cable TV usage, towels, bed linen and hair dryer, cleaning before and after your stay (daily cleaning is available upon request for extra charge of 15 euros), all apartment amenities and facilities as mentioned on our website pages and in our correspondence. A one- and two- bedroom apartment security deposit of 100 euros or four- bedroom apartment security deposit of 200 euros is required upon arrival. Security deposit of 200 euros per apartment is required for accommodation with more than 6 guests in one apartment. Тhis is to cover any additional costs that might be incurred. The deposit can be provided ONLY by credit card at check-in time. The security deposit will be released by your credit card’ issuing bank automatically in 3 work days, sometimes it could take up to 15-21 days. The security deposit/pre-authorisation is not held by RIGAAPARTMENT, as we do NOT charge your credit card, we only pre-authorised certain amount. Security deposit will be refunded in total if the apartment is in good order and there are no breakages in or damages to the apartment. Any excessive cleaning costs will also be deducted from the deposit. After you have booked your stay with us, you can extend your stay (depending on availability) by simply letting us know before you arrive. If you are already staying with us and you would like to stay longer, please let us know at least 24 hours before your check-out date. We will do our best to accommodate your new plans and this can include relocating you to a similar apartment should this be necessary. The total reservation price is charged 30 days before the arrival. - in case of a “No-show” the total reservation price will be charged and is non-refundable. All cancellations are confirmed via email immediately after the reservation has been cancelled. The total reservation price will be charged right away after booking and is non-refundable. When you make a reservation you are booking an apartment type (not a specific apartment). Each apartment type includes similar apartments of similar size and equipment; however, interior design can be different. Reservations can only be taken and confirmed by making an advance payment of 30% or 100% of the full rental amount based on chosen pricing options. This can be paid using a debit/credit card or a bank transfer. We will process your booking within 24 hours of receiving your request and payment details. Please note, until you receive a confirmation email from reservation@rigaapartment.com your booking is not confirmed. You can check-in anytime from 3PM by local time. Apartment keys will wait for you at RIGAAPARTMENT SONADA 24/7 reception at 129 Gertrudes Street. PLEASE NOTE, RIGAAPARTMENT SONADA main entrance is from 5 Valmieras Street side! Arrangements for checking-out will be made at the same time. The balance of the full apartment rental amount is payable on arrival at check-in time. PLEASE NOTE that check-in cannot be completed until full payment and security deposit pre-authorization for the apartment has been received and approved. An apartment key is provided at check-in time after the full rental amount has been settled. The cost of any keys needing replacement will be taken from the deposit. During the check-in process, our receptionist will provide you with any information which may be required during your stay such as the location of nearby shops, good places where you can eat, sights you may like to see, places to go at night, etc. Always ask our receptionist for anything that would make your stay more enjoyable and convenient. You can checkout any time up until 11AM local time. Later check-out times may be requested, although we may not always be able to accommodate late changes and will depend on availability and on how busy we are. At check-out time please drop keys into mailbox “RIGAAPARTMENT GERTRUDA check-out” located in front of elevator at ground floor. Please note that a more detailed inspection of the room/apartment is usually made after the check-out time and we reserve the right to make charges for any damages or breakages found before the room/apartment is occupied again. The security deposit should be released by your credit card issuing bank automatically in 3 work days, but sometimes only in 15-21 day period. The security deposit/pre-authorization is not held by RIGAAPARTMENT and we do NOT charging your credit card. Please be aware that bed linen and towels should be placed where they were originally found. The bed linen and towels are NOT gifts and should remain in the apartment. In our entire short stay apartments and rooms, smoking are not allowed. You will be asked to sign a document that you agree to a 100 euro fine if ANY evidence of smoking is found in the apartment or in any of the building areas such as window ledges, the lift, stairs or the entrance area near to the reception. Please note that we comply with the local health and safety guidelines and recommendations provided by the EEC on smoking in public places. More guests stay in the property than agreed. Excessive noise is made in the evening hours or at night. Sub-letting the property you have rented (or giving it to other people). The number of people residing in the apartment should be the same as confirmed in the booking. Accommodation for additional guests may be requested. A 10-euro charge for each additional guest per night will be charged. We reserve the right to cancel any reservation, without refund, if an unconfirmed number of people stay overnight in the apartment. RIGAAPARTMENT does not allow any pets in the apartments. A 100-euro fine will be claimed if pets will be accommodated in the apartments. 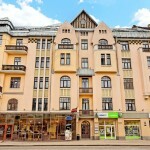 Apartments are located in a residential building in Riga city center. All our guests are asked to respect the property and privacy of the neighbors and to not make any excessive noise between the hours of 22:00 and 08:00. This rule is applied as per the Latvian Residential Buildings Law so any late and loud partying is not, unfortunately, permitted. RIGAAPARTMENT.COM Ltd. is not responsible for lost or forgotten personal things at the apart hotels premises. During your stay, the apartment and all equipment and furniture should be treated with care and kept in order. Immediate notification to RIGAAPARTMENT staff will be expected of any damages or breakages in the apartment. You (The Tenant) are financially responsible for any damage to the apartment. This includes losses caused by you (The Tenant) or a third party’s negligent actions and behavior. A summary check will be made of the apartment at check-out time. However, a more detailed review of the condition of the apartment and all equipment and facilities will be made soon after check-out and before another guest occupies the apartment. The Tenant is responsible for any damages or breakages found that are over and above normal wear and tear and usage. In this case a detailed statement of damage along with an invoice for the repair or replacement cost will be sent by email or fax immediately. Any costs will be deducted from the deposit immediately if this is still possible. Any costs will be claimed by return if they are greater than the deposit or where the deposit has already been returned. Please note, immediate notification after check-in of any damages to, breakages in or issues with the apartment is expected. RIGAAPARTMENT can then take any necessary action to resolve any issues and make sure all the equipment and facilities are working and provided as expected. Damage deposit is fully refundable upon check-out and subject to a damage inspection of the accommodation. The deposit must be paid upon check-in, in cash or by credit card, along with a balance and is fully refunded at the check-out if the apartment is in good order and the company does not have any claims). The costs of damages or cleaning beyond what would be expected after responsible usage of the apartment will be deducted from the deposit, and the refunded amount will be the remainder of the damage deposit. Please remember Entire apartments ARE fully NON-smoking! At the check-in time you will be asked to sign a document that you agree to a 100-euro fine if traces of smoking are found in the apartment. Children One child under 2 years old stay free of charge, for children’s cots/cribs. 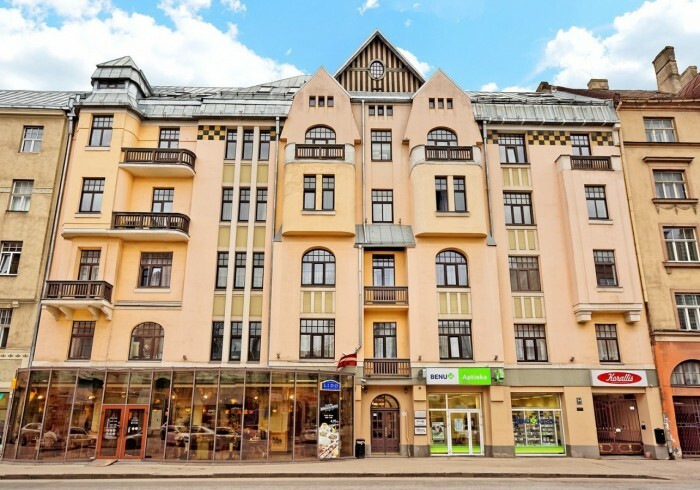 RIGAAPARTMENT GERTRUDA renovated historic building is located in Riga’s city centre. It features high ceilings, wooden floors and stylish furniture. It is just 15 minutes walk or 5 minutes drive to the Old Riga Town. There are 24 apartments and 19 rooms which vary in size and accommodation; a range of one, two and three bedroom apartments are available for rent with everything you might need during your stay. Rentals can be for any period from an overnight stay to weekends or for as long as you might need. Each of our apartments feature a fully equipped kitchen with a linked dining area. There is a bathroom with either a bath or shower, a washing machine, iron and ironing board, hairdryer and liquid soap/shampoo. The living room has comfortable sofas and chairs and features a large flat-screen TV and wi-fi access. Apartments can come with one, two or three bedrooms each with double or single beds. All bed linen and towels are provided. Spacious wardrobes come equipped with hangers.There is a separate entrance on the ground floor of our building to the local LIDO restaurant. The LIDO is well known for wide choice of excellent value traditional Latvian food. Important: Your apartments are located at 54 Gertrudes Street. You can collect keys anytime after 3PM at RIGAAPARTMENT SONADA 24/7 reception at 129 Gertrudes Street. Arrangements for checking-out will be made at the same time. All our apartment and rooms are NON-smoking. The pre-authorisation of 100 or 200 euro amount via credit card requested on arrival. The pre-authorisation will be released by your credit card’ issuing bank automatically in 3 business days after your check out in total if the apartment is in good order and there are no minibar use. Pre-authorisation is not the same as prepayment. Prepayment is when the guest is charged in advance, pre-authorisation is just a hold on their credit card.